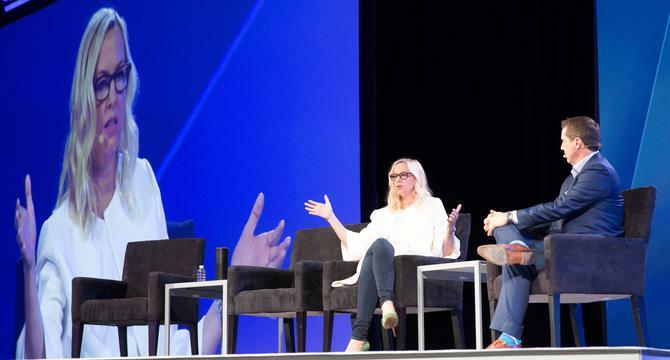 The first thing you notice when you start talking to Box CMO, Carrie Palin, is her knowledge of digital marketing and the way technology and data can facilitate how a business finds relevance, scale and growth. That was certainly the reason CMO sat down with this first-time marketing chief last week, who was appointed nine months ago to help Box transform as a business and improve the way its marketing and sales teams operate. But surprisingly, it was Palin’s passion for building her team and a familial culture that rewards failure as much as success, along with her commercial attitude and belief in the strategic role CMOs must play today, that really captured our attention. Box is a 12-year-old US-based SaaS upstart that made its name as a file sharing and syncing tool for improving productivity and collaboration. Over the years, and as its capabilities expanded, the company has been successful in ousting enterprise-grade enterprise content management (ECM) solutions in global organisations as large as IBM. The company is now pivoting into what it’s calling ‘cloud content management’, servicing the largest Fortune 500 companies as well as individual consumers globally. To support this ambition, it launched a fresh brand strategy and go-to-market program in April. Behind the scenes, Palin is building a marketing technology stack that not only better scales personalisation and lead management, but can also help sales predict and engage the right prospects when it’s time to reach them. But without the right people and team structure to support the tech, it won’t succeed, she says. “It takes the insights humans glean from technology to succeed,” she says. And if her approach is anything to go by, Palin has the people factor sussed. Palin is Box’s first CMO and spent the last 20 years working as a marketer for Dell and IBM. She sees the marketing opportunity ahead as massive. Box has been growing at 30 per cent year-on-year, and now claims two-thirds of Fortune 500 companies as customers, including GE, IBM, AstraZeneca and Pfizer. It also has a reseller and product development partnership with IBM, which rolled out Box to its 300,000 employees. “Box was looking for a CMO as it was pivoting into the next phase of growth,” Palin explains. “We started as a cloud storage company, then moved to content collaboration, and the enterprise file sync and share space, which also represents Google Drive, OneBox and DropBox. And therein lies the marketing challenge: Box could be relevant to anyone, from an individual to IBM. Palin says a key focus this year is the commercial space, where governance and enterprise-grade SaaS is just as important as it is in high-end enterprise. However, Box doesn’t have the sales staff to scale to hundreds of thousands of commercial prospects. That’s where marketing automation comes in, and Box has rolled out Marketo’s platform in the past year. Marketo’s marketing industry heritage, the fact it regularly adds new modules, such as account-based marketing and personalisation, and also actively works in a best-of-breed partner ecosystem, were key reasons behind the investment, Palin says. To date, Box is using Marketo to do “basic blocking and tackling and basic passing” Palin says, with all lead flow between marketing and sales passing through the platform. What’s already become apparent is the way automation bridges the gap between marketing and sales, and Palin says the two functions are actively building campaigns together. Palin is now working to build out a martech stack with a host of complementary solutions, including account-based marketing tools, predictive analytics, and artificial intelligence-powered sales enablement. “There are a set of CMOs trying to be as bleeding edge on tech as possible to get to scale and I’d characterise Box’s culture as that too,” she says. Predictive analytics, for instance, helps Box identify buyers in market and showing all the intent signals, and use that as the feeder for its account-based marketing and outbound push, she said. Palin chose 6Sense’s predictive intelligence platform, which also offers time-bound intent. On top of this, Box needed better lead management, so Box brought on Conversica’s AI-powered automated sales assistant to filter marketing qualified leads before they reach the physical sales team. Another recent addition to the martech stack is Allocadia, bringing additional investment reporting into the mix. “The I is very important in ROI and we’re holding ourselves to this – our optimal metric this year to the company is an ROI metric,” Palin says. But Palin doesn’t want to “vector too hard on the technology”. “Part of trying to be bleeding edge is that we’re going to bloody our noses a bit. I need people and a culture that fails fast,” she continues. A hard lesson learnt early when transitioning to Marketo was that Box didn’t have enough expertise in-house. “We needed to be faster at growing up our Eloqua expertise into Marketo, and that’s training, understanding the tools, and taking the education Marketo offers very seriously,” Palin says. Creative skills are just as vital at Box, and the company has brought on VP of brand, Greg Johnson, to lead its brand charge strategically. “Greg has done a brilliant job building out a brand presence around our new brand voice – ‘work as one’. We have a creative team that’s equally as strong as our demand marketing team,” Palin says. The ambition is to have the look, feel, ease and agility of a great consumer brand. “Automation and serving up customer data is great, but if you can’t actually reach through what you put in front of people, either through the way it looks, feels, promises, or the words on the page, they’re not going to engage with you,” she says. As her first stint as a CMO, a role that’s seen her relocate across the US, Palin says she wanted to get the job right straight out of the gate. One way she’s striving to do this is by having a constant, transparent feedback loop between herself, the COO and CEO. Palin came to leadership a little later in her career, after a mentor convinced her she was good with people and it was time to lead. Now, it’s the investment and time in people that she sees as her most important role as a CMO. “Growing their ideas and developing their careers, and curating teams that have a great energy and love to win, but also can fail and celebrate it, is key,” she says. “It’s about knowing we have each other’s backs. I was talking to my leadership a week ago about this concept of family: You don’t get to choose your family, but for the most part, you love them and have their back. Ensuring the right team captains were installed at Box was a vital part of the process for Palin in her early months and it’s another must for the CMO, she says. “I had to make sure everyone on this team had the right people leading their portion of the team,” she says. “If your team is sideways because of a leader not getting it done, or supporting their team, those staff can’t do their jobs. Leadership that makes you better and humbles you every day is a must. You can’t be afraid to put more talented people than you in those positions who will succeed you at some point and do better than you. It’s the whole goal. Palin also says one of the best things her CEO, Aaron Levie, did was introduce her to other CMOs in the Valley, from big brands to startups. “Everyone comes into something for the first time in their lives wondering if they can do this – that imposter syndrome,” Palin says. “What I found from making relationships with these powerful people is they’re all humans at the end of the day and they have their gaps. The transparency they shared with me was so validating and illuminating. Palin says this makes her a life-long learner. “You don’t have to be perfect, you just have to believe you can do this, find great mentors that can coach you, direct you, and work hard,” she says. Being energetic and excited about what you do every day is infectious and as a CMO, it’s a vital attribute, Palin adds. “You need to get staff pumped up about what they’re doing - it seems basic but it’s a big deal,” she adds. Palin’s final attribute for the modern CMO is to be business minded. “If someone were to ask me to describe myself at this stage of my career, 10 years ago I wouldn’t have said this but now I will: I’m absolutely a business person who affects the business through marketing, versus being a marketer first,” she says. Nadia Cameron travelled to Marketo Marketing Nation summit as a guest of Marketo.